In commemoration of the World Autism Acceptance Month, the Autism Society Philippines is launching the Autism Works PWA Employability Seminar Series, which will provide hard and soft skills training to adults on the spectrum who are officially signed up for the Autism Works program. They must have been already interviewed, and have signed the Autism Works affirmation of commitment contract. We are partnering with Accenture Philippines, one of the country's leading providers of technology services, for training in Microsoft Powerpoint Fundamentals, Microsoft Excel Basics + Intermediate + Advanced and Microsoft Word for several Saturdays of April and May 2018. 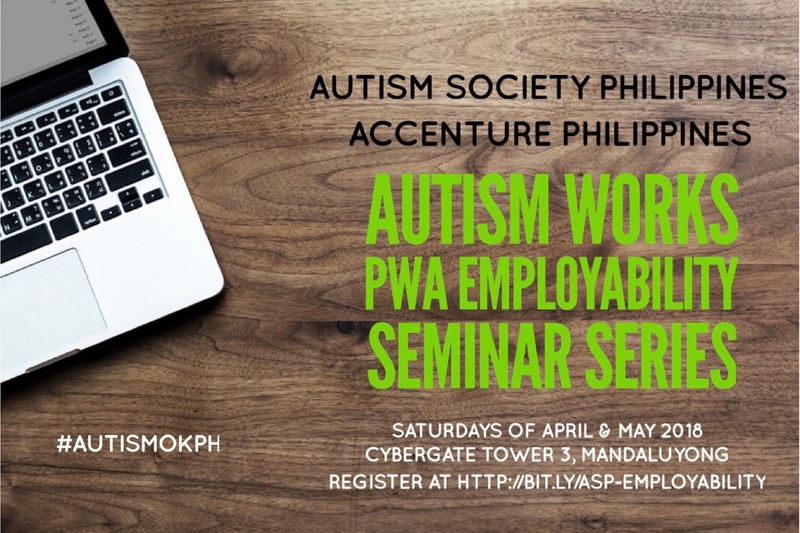 The ASP's Autism Works career placement initiative aims to build an Autism-OK Philippines by creating genuine employment opportunities in compassionate workplaces. ASP's CBR-inspired employment model empowers PWAs and their families towards success at work, through careful profiling of candidates, customized job matching, job coaching training and partnership with respected transition specialists and employers. Since the program first started in 2016, it has grown by leaps and bounds, filling 80 positions in 22 enterprises in the the provinces of NCR, Cavite, Cebu, Davao, Iloilo, Laguna and Quezon. To be considered for Autism Works, PWAs may send their resumes to autismphils@gmail.com. We will reach you for schedule of interviews and assessments. We are working through a long queue applicants, please be patient.